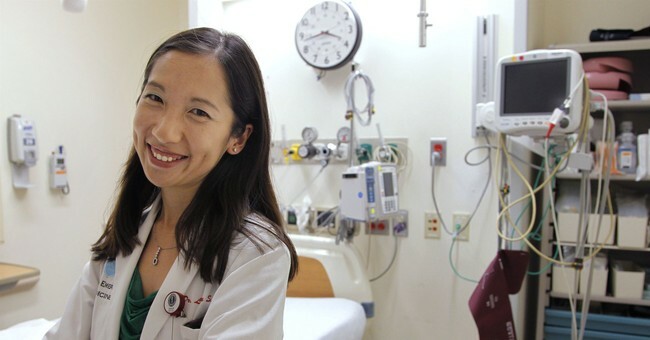 Planned Parenthood president Leana Wen appeared on “The Daily Show” Thursday evening and laughed with host Trevor Noah about President Trump’s rhetoric on late-term abortion. Both she and Noah skipped any reference to the remarks made by Democrats defending late-term abortion up to birth which had prompted Trump’s comments. Wen also misled about the reasons women get late-term abortions. “Good response from the audience,” Wen said as the crowd continued to laugh. According to the most recently available 2014 data from the Guttmacher Institute, Wen is correct that only 1.3 percent of women have abortions after 21 weeks, however, that still comes to just over 12,000 abortions a year. In his questioning, Noah was likely referencing the remarks President Trump made during his State of the Union address in which he discussed the push for late-term abortion legislation from Democrats and comments made by Virginia Gov. Ralph Northam. The “Reproductive Health Act” became law in January and, among other things, allows abortion at “any time” to protect “a patient’s life or health” and removes criminal penalties for abortion. However, Wen and Noah did not mention such legislation, instead acting as though President Trump had brought the issue up unprompted. They also did not mention the comments from Virginia Gov. Ralph Northam who told WTOP about cases where babies could be left to die after birth back in January. His comments were regarding Virginia Del. Kathy Tran's (D) bill that, she initially admitted, would allow abortion up through labor. The idea of abortion “after birth” which Wen, Noah, and the audience found so amusing was in reference to those comments from Northam about allowing infants to die after a failed abortion. The stories of abortion survivors like Gianna Jessen and Melissa Ohden show that infants who survive abortions do exist, contrary to the claims of some abortion advocates. Democrats have shied away from the issue of strengthening legal protections for abortion survivors in these situations. A measure to do just that recently failed in the Senate and has been repeatedly blocked in the House. Democrats often point to the Born-Alive Infants Protection Act, which became law in 2002 and ensured full legal rights for infants “born alive at any stage of development,” however, that measure does not specify a requirement of basic medical care for infants born after an abortion or any criminal penalties for doctors who do not comply with it.